Philadelphia, July 29 – Rep. Tammy Duckworth offered a simple but powerful message of the American spirit and inclusion on the last night of the Democratic National Convention. Duckworth represents multiple groups who often are overlooked in American politics. She is the first Thai American to be elected to U.S. Congress, as well as the first woman with a disability to become a member of the House of Representatives in 2012. This path was not an easy one, as she and her parents struggled financially after her father was laid off in his 50’s. By saving money and not using the bus, using affordable student loans and working many hours as a waitress, Duckworth eventually achieved her dream of graduating college. 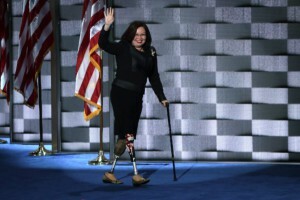 Duckworth lost both of her legs in 2004 while serving in Iraq. Her fellow soldiers saved her life, which she said shaped her life in terms of her feelings of camaraderie and selflessness for this country. Duckworth’s personal story resonated among potential donors and supporters for her upcoming race against Sen. Mark Kirk, who also has a disability, for the Senate. She lauded the Democratic Party for its policies and perspectives. Lorella Praeli, another immigrant with a disability, also spoke Thursday evening. Serving as Clinton’s Latino Outreach Director, she only recently became a U.S. citizen. When she was two years old, she was hit by a car and lost one of her legs. Her mother decided to immigrate to America where her disability would not prevent her from achieving her goals. “My parents were determined that I would reach my full potential and not be limited by my disability,” she said. Duckworth and Praeli both represent commonly overlooked and underserved populations that make up a large part of the United States. By demonstrating their abilities and showcasing their achievements last night at the DNC, they serve as examples that people with multiple minority statuses can achieve the American Dream, regardless of place of birth, financial situation or disability status. The promise of the ADA and Olmstead are still unfulfilled promises and those laws and court orders are violated all the time. 70% of Americans with disabilities are unemployed, almost 50% of Americans with disabilities live below the poverty level, hundreds of thousands of people with disabilities have been waiting for years for Medicaid Disability Waivers Services, and even the federal government offices of civil rights and the White House have failed to act adequately on disability rights violations. The National Council on Disability is studying the correlation between disabilities and poverty.